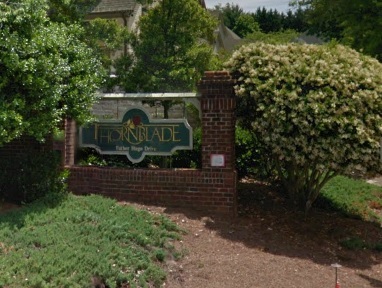 Thornblade was established in 1988 and is an upscale community in the Eastside of Greenville. It consists of 370 homes built by various local custom home builders. The community is made up of multiple sections – some gated and non-gated areas: The Enclave at Thornblade, The Gardens at Thornblade, The Fairways at Thornblade, Tamaron Park, and Thornblade and the Villas at Thornblade. Thornblade real estate offers custom built homes in various styles – European, Charleston and Colonial. Common housing exterior in real estate properties in Thornblade are made of brick, concrete siding or stone accents. Since the community is located on a private golf course, you can find homes that back onto the scenic golf course. Most homes enjoy the lush environment as there are many mature trees, beautiful view of the golf course, rolling hills and well-landscaped yards. Homes for sale in Thornblade are sold between $400’s up to a million. Home sizes range from 2800 – 5900 sq.ft. in a lot size ranging from 0.25 acre to 2.6. Though there are no formal amenities in Thornblade aside from common areas and sidewalks, residents who choose to become a member of the Thornblade Club enjoy a number of great amenities including access of the swimming pool, tennis courts, golf course, clubhouse, restaurants, and/or social activities. What’s going on nearby Thornblade Real Estate? Residents of Thornblade real estate also have easy access to shopping. Groceries and other shopping areas are only a drive of few minutes. Restaurants are also nearby. It has also easy access to airport, schools, hospital, golf course, and parks. What schools are assigned to Thornblade? If you buy a home for sale in Thornblade Subdivision in Greer SC, the local schools serving this community are Buena Vista Elementary, Northside Middle, Northwood Middle, Riverside Middle, and Riverside High With great schools, a variety of living options in a safe and very convenient community. Thornblade is the perfect place for you. Looking for a home in Thornblade? If you are interested in the current homes for sale in Thornblade Subdivision in Greer SC, below you will find the latest homes available in this community. Our ‘for sale’ property information is a direct feed from the GGAR MLS and is updated multiple times per day. Click on the listing to get more information or you can call us if you have any questions. If you are thinking of selling your home in Thornblade. Contact us at 864-881-1352. We, at the J Michael Manley Team, can help you every step of the way. We have a team of experienced listing specialists who have helped many Greer SC home sellers sell their homes for top dollar. Find out what your home in Thornblade in Greer, SC is worth. For more information about the Greer – Thornblade Real Estate, please contact the J Michael Manley Team at 864-881-1258. Sign up at our website to get the latest homes for sale in Greer. Are you looking for something similar to Thornblade real estate? Check out other communities in Greer Real Estate.